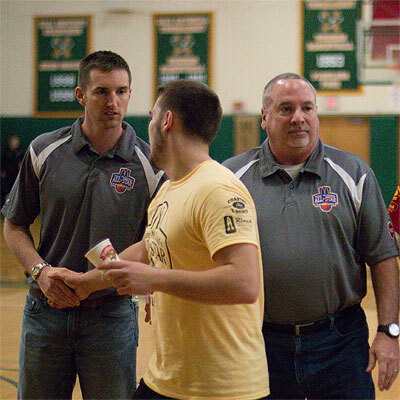 Welcome to MABC1.org, the official site of the Maine Association of Basketball Coaches. 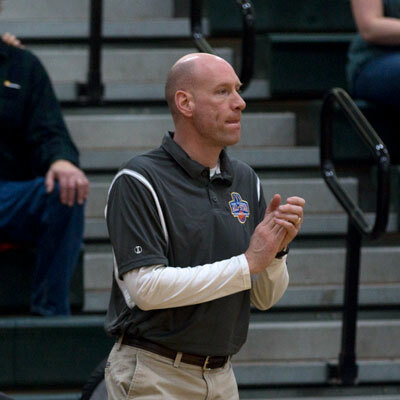 This site is designed to be the communication mechanism that the Association and its membership can use to provide the best opportunities for Maine basketball players. 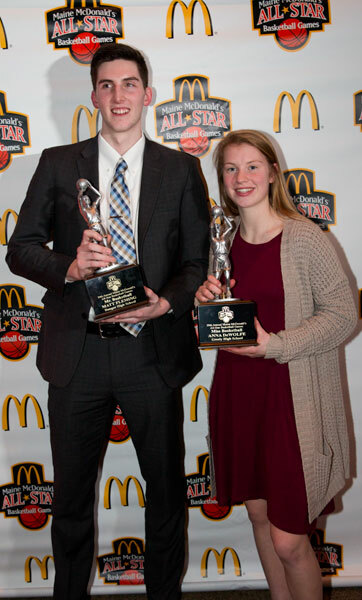 Bangor High School's Matt Fleming and Anna DeWolfe of Greely High School were named the Maine Association of Basketball Coaches' Mr. and Miss Maine Basketball at the McDonald's All Star Banquet in Bangor. Both players led their teams to state championships on the previous weekend. Fleming, a 6'6" guard/forward who played his freshman and sophomore seasons at Oxford Hills HS, averaged 21 points, 4 assists, and 11 rebounds per game for the Rams. He plans to attend West Point on a full basketball scholarship. DeWolfe, a 5'7" point guard, averaged 25 points, 6.5 steals, and 6 assists per game for the Rangers. She was a four-time Western Maine Conference 1st team All Star and four-time Portland Press Herald All State Player. She plans to attend Fordham University on a full basketball scholarship. Mackenzie Holmes of Gorham and Faith Blethen of Boothbay were the other Miss Basketball finalists. Joining Fleming as Mr. Basketball finalists were Ben Onek of Deering and Wol Maiwen of Edward Little. 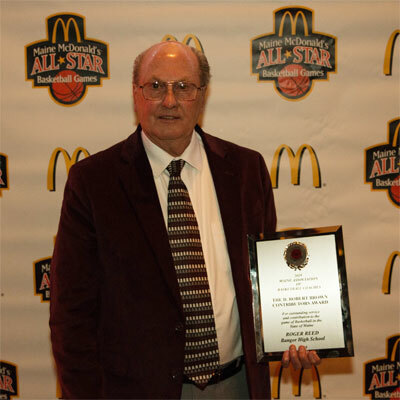 Mr. and Miss Basketball honorees were the marquee announcements at the 2019 Maine McDonalds/MABC Senior All Star Banquet at the Anah Shrine Hall in Bangor on March 8th, but several other awards were presented. 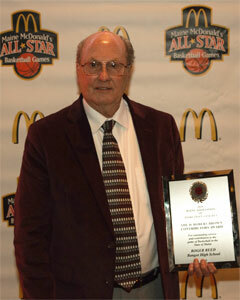 Longtime Bangor High School Coach Roger Reed was awarded the MABC Bob Brown Contributor Award. Reed, who coached at Bangor from 1985 to 2012, won eight Class A State Championship during that span. He has an overall record of 573-201. Travis Lee and Joe Bailey of WMTW-TV in Portland, won the MABC Media Award for their work with their work on Hoops 8, the first and longest running basketball highlight show in the state of Maine. Lee is the on-air presence of the show while Bailey is the driving force behind the scenes. The MABC also presented three Maine McDonalds Spirit of the Game Awards to basketball team members who "embody the spirit of the game of basketball, exemplify sportsmanship, show an ability to overcome obstacles and boundaries, and support and inspire their teammates and coaching staff." In 2010, these awards were renamed to honor the 2009 recipients - The Patrick Thibodeau Spirit of the Game Award (West Division) and the Joshua Titus Spirit of the Game Award (East Division). Receiving the honors this year were Gabby Sherman of Old Town. The Old Town manager has been battling cancer since the age of 13. Other Award winners were Edward Little HS Unified Team member George Kempstra and Grace Stacey of Portland for her selfless act of befriending and aiding two basketball- playing sister who came to Portland HS from the Republic of Congo. Other award recipients were Celine Lawrence of Marshwood High School in South Berwick and Alex Austin of Scarborough, who each was awarded a $2,000 Maine McDonald’s academic all-state scholarship. 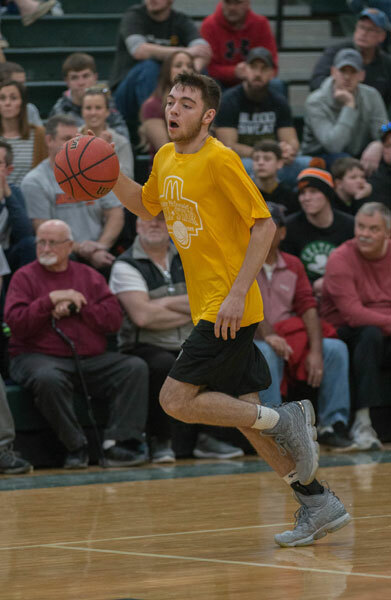 Peyton Grant, a 5'4" sophomore guard for Dexter High School, made 49 of 50 foul shots to capture the 2019 Maine Foul Shooting Championship at Husson University on March 9th. 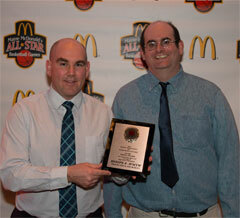 The competition was part of McDonald's All Star weekend and featured regional champions from four areas of the state. 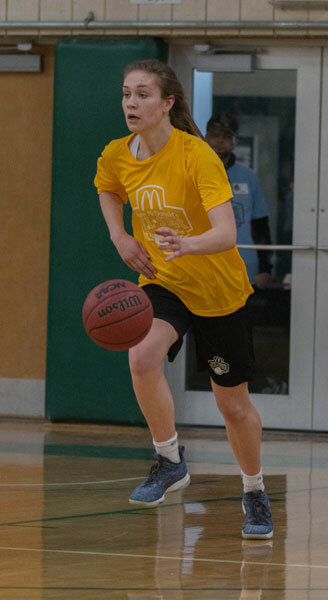 Grant, who plays for her father Jody Grant, put the pressure on the other shooters early as she was the first to step to the line prior to the All-Star games. Grant had also made 49 of 50 shots in the Eastern Regional Championship. Other regional champs who competed were Faith Sjobeg, a 5'6" freshman guard and Northern Region Champion from Presque Isle HS, Central Region Champion Annie Cooke, a 6'1" guard/forward from Skowhegan, and Miss Maine Basketball Finalist Faith Blethen, a 6'1" guard/forward and Southern Regional Champion from Boothbay Regional. In the boys competition, sophomore Parker Desjardins of Forest Hills HS and Chris Albert, the Northern Region Champ from Old Town HS each made 47 of 50 foul shots to force a best of 10 shootout. In the first round, both shooters made 8 of 10 to force a second shootout. Desjardins shot a perfect 10 for 10 in that round to win the championship. In the Central Regional Championships, Desjardins had made 45 of 50 in the Central Region to advance to state championship. Albert had qualified for the state championship by sinking 45 of 50 in his region. Other Regional Champions competing were Jeremy Richard, the Eastern Region Champion from Foxcroft Academy and Nicco Petre, the Southen Region Champion from Falmouth. In the opening game of McDonalds All Star Weekend, it was the girls from the South winning over their northerm Maine counterparts. Powered by Miss Maine Basketball Anna DeWolfe of Greely and Miss Maine Finalist MacKenzie Holmes of Gorham, the girls in gold took the Class AA/A/B game by a score of 69-51. 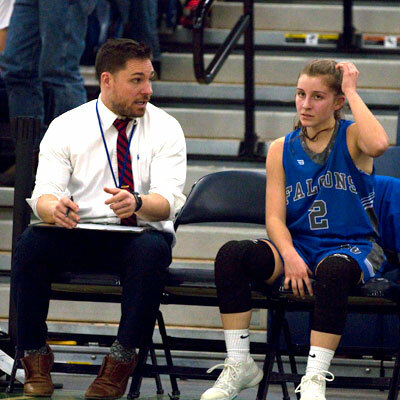 Holmes, a 6'2" center and the 2018-19 Gatorade Maine Girls Basketball Player of the Year, led the way on offense with 24 points and was a force defensively in the paint. DeWolfe also had a hot hand with 20 points, including 3 from behind the arc. Katie Whitmore of South Portalnd chipped in with 8 points. The North trailed at halftime, 36-30 and were not able to make up the difference in the second half. They were led by Delaney Haines, a 5'8" shooting guard from Deering High School. KVAC Player of the Year Annie Cook of Skowhegan scored 9 points, as did Grace Fontaine of Edward Little HS. McKenzie Beaudry of Foxcroft Academy and Bailey Donovan of Bangor each scored 6 points. 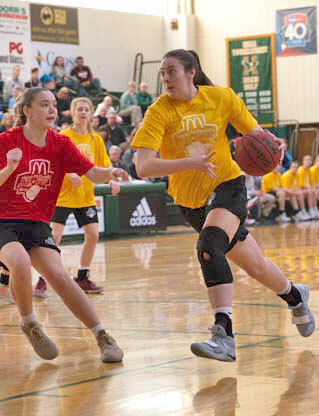 The Northern Maine team with representatives from Class AA, A, and B schools used a balanced attack and an overtime sudden victory basket to defeat the South, 120-118 at the 2019 McDonalds Senior All Star Weekend at Husson University on March 9th. Recently named Mr. Maine Basketball Matt Fleming of Bangor High School scored the winning basket in "sudden victory" after the North took the ball out of bounds with 2.6 seconds left in regulation and passed it to the South, who promptly made the basket to send the game into overtime. The unusual circumstance led to an unorthodox ruling which mandated that the first basket in overtime would win the contest. In the overtime, the North won the tap and Fleming got the ball, drove to the basket and laid it in for the victory. Damien Vance, Fleming's teammate at Bangor High School, led the North with 15 points. Fleming's final two points gave him a total of 14. Garret Trask, a 6' guard from Herman, scored 13 points. Mt. Blue High School's 6'1" point guard James Anderson scored 12 points. Scoring 11 each were Jonah Hudson of Presque Isle, Mr. Basketball finalist Wol Maiwen of Edward Little HS, Conner Robertson of Orono HS, and Cooper Wirkala of Oceanside HS. Oxford Hill's Spencer Strong added 10 points. The South, who led at halftime 60-59, we led by Andrew Hartell of Cape Elizabeth with 26 points. Mountain Valley High School's Keegan Davis scored 19 points with 5 three pointers. Nick Feorilla, a 6'8" forward from Scarborough HS, also scored 18 points. Slam Dunk Champion Andrew Storey of Greely finished with 16 points. 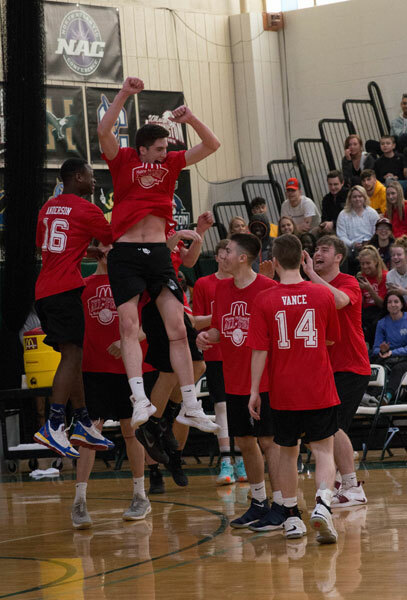 The South C/D boys defeated the North by a score of 111-102 in the 2019 McDonald's Senior All Star Game at Husson University in Bangor. With the South holding a 52-51 lead at the half, the boys in gold extended their lead in the second half for the victory in the well-attended game. Leading the way on offense for the South were Boothbay Regional High School's Stephen Reny and Hall-Dale High School's Ashtyn Abbot, who each scored 22 points. Winthrop's 6'8" center Cam Wood displayed an inside and outside attack in scoring 15 points. Brandon Giboe of Forest Hills score 9 points and Temple's Ilija Ivkovic added 8. Leading the North was Sumner 6'6" guard/forward Colby McLean with 13 points. Central Aroostook guard Ben Thomas had 12 points, scoring 10 each were Elijah Wood of Penobscot Valley HS and Drew Hayward of Woodland. A full day of basketball concluded with the South Girls C/D Senior All Stars defeating the North with a score of 53-47 on March 9th at Husson University. Miss Maine Basketball finalist Faith Blethen, a 6'1" guard/forward from Boothbay, led the South with 24 points. Kaeti Butterfield of Monmouth Academy and Hannah Moholland of Richmond HS each chipped in with 8 points. The North's top scorers were Madawaska's Jenna Dugal and Kylee Joyce of Narraguagus HS, who each scored 9 points. Central Aroostook guard Ashlee Harris added 6 points. The South led at the half 53-47.